I have been playing guitars and drums for 30 years and have been extensively gigging for over 25 years. I am a composing musician and have written material that was recorded at the BBC’s Maida Vale studios for BBC Radio 1. 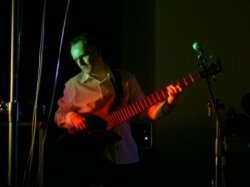 I am a full time private tutor teaching both adults and children; guitar, bass guitar and drums. I have been teaching over 10 years to both children and adults. I believe that every player is different and even though I have an extensive library of lessons that I have developed over the years, I always approach lessons with the individuals music tastes at the core. I tailor lessons specifically to each player so that lessons will suit your ability and playing style and will help you learn at a pace that suits you personally. Lessons can be for 30 mins or an hour. My lessons are friendly and relaxed and parents are welcome to accompany their children to lessons. Reply from: Stuart: Thanks for the feedback Mikka - it's much appreciated. I hope you continue to enjoy our lessons. StuartFrom Timothy (5/5): Stuart is a charming gentleman, with a very professional attitude. He is considerate, patient and very knowledgeable. He plays in a group himself, so is able to relay things to me from his own practical experience. From my first lesson, Stuart has made me feel relaxed and quietly confident that even at 44 it's not to late for me to learn to play the drums correctly! I learn something new every time and its a pleasure to attend the lessons. Reply from: Stuart: Thanks Tim, feedback much appreciated. Your lessons are a pleasure and I hope you continue to enjoy your lessons and build on the fantastic progress you have already made.